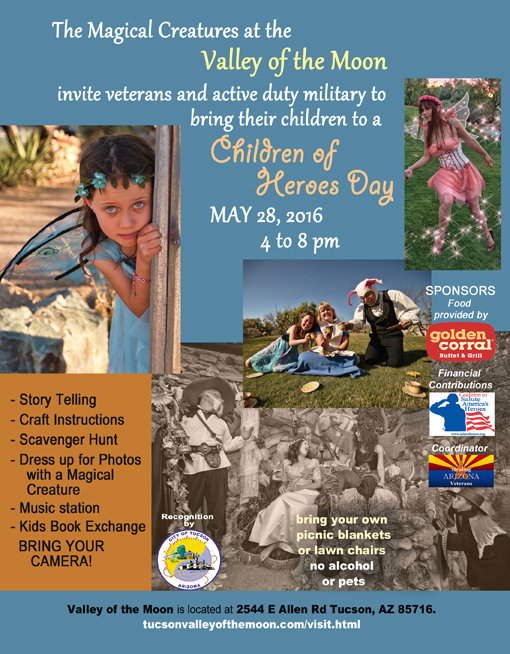 The magical creatures at Tucson’s historical Valley of the Moon do hereby invite all Veterans and active duty military personnel with children to celebrate with us at our CHILDREN OF HEROES DAY! This event is created for children from 2-15 years old and will be held at the Valley of the Moon on May 28. Please mark your calendars. It is a FREE event featuring a scavenger hunt, story telling, crafts instructions. Dress-up for photos with a Magical creature, a music station and a really special opportunity for kids to bring in a book they have read and exchange it for another of their choosing. TICKETS: None needed. This event is a gift to veterans and active duty military personnel. FOOD: ​Food generously donated by Golden Corral Restaurant. ​Volunteers are still needed for this event. We are looking for storytellers, musicians, and crafters. If you are interested please get in touch.